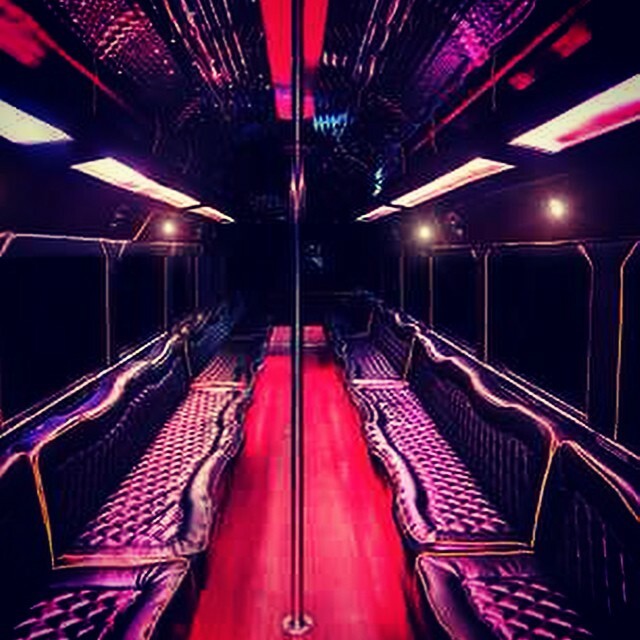 The 40 passenger party bus is the most commonly used party bus in the nightlife industry. These beautiful busses are equipped with top of the line interior and state of the art sound systems. The 40 passenger bus is great for your bachelorette or bachelor party. If you're looking for busses for your winter formal or prom party busses we can locate the best party bus at the best price available to you in the San Antonio area. Our company can provide you with suggestions for your trip and make planning your party a bit simpler. We provide a service through our subsidiary NocturnalSA that will drop you off downtown San Antonio and set up club arrangements to get you VIP services to clubs all over the city. For any booking questions in regards to our party bus services such as availability, discounts on party busses, costs of busses for special events please feel free to speak with our agent support and we will be happy to answer your questions. Also fill out our Quick Quote page so that we can get to work on your request now! For requesting amenities such as TV, Sound System, Particular decor, Alcohol, cups, bar service please feel free to ask in our quick quote page and we will respond to all of your party bus requests. These are just a few of the Party bus services provided by our company. For questions about rates for 4o passenger bus please fill out our quick quote page. As soon as you complete the information form your request will be emailed to over 50 companies in San Antonio who will contact you with the best price available according to your needs. for questions about discount party busses in San Antonio and surrounding areas including live oak, Buda, Austin. Does the party bus have a bar? There is really no specific answer to this as every party bus is different but if you request it we will locate all the companies in the area that have a bar for you and provide you with the best rate on that particular vehicle. Can the party bus provide cups and drinks or ice? Some busses do provide extra services for a fee. The cost veries and the alcohol is not typically provided. There is no time limit on your trip. your tip will however be prorated and an extra $100 will be added to every hour over that time. What happens if we leave something on the party bus? We are not responsible for property lost on our busses but you can contact the vendor and ask that they retrieve your belongings. To make any requests please list them when filling out our Quick Quote Page and we will be sure to answer any of your requests. Disclaimer Avery Limo Broker functions as a brokerage service. Our services for transportation are with an agreement through various limo companies and establishments in San Antonio and surrounding counties. Upon confirmation of reservation we provide the following information: vehicle size and type Photos if requested cost of deposit that our client agrees to pay contact information of the limo/transportation company that will be providing the service. We always tell our clients to contact the company before the date of their reservation to double confirm all of this information. In addition we ask that that our clients take the time to do their due diligence by inspecting the vehicles in person before hand. The contracts and responsibilities of transportation are solely through the transportation company and the client. This means that the transportation companies themselves are responsible for the representation , quality of service and conditions of their vehicles .This is also true for the establishments clubs , venues , etc . Clubs / Venues have the right to refuse entry , service at anytime and AveryLimoBroker cannot guarantee their compliance. Deposits are non-refundable, although we do reserve the right to allow a transfer of a deposit for a future booking.By clicking the check box the client agrees to receive contact from AveryLimoBroker and acknowledges they have agreed to and read these terms.